What is the purpose of a matter budget? Certain matters require a budget to be set due to specific client needs. Your firm may encounter times when a client is uneasy about moving forward with a case due to budget concerns. The client may agree to a retainer, but is anxious about overspending and needs the ability to maintain the financial stamina to see a case all the way through. The Matter Budget Report gives you control over this fear by setting a limit on the amount of money that can be billed for the matter. 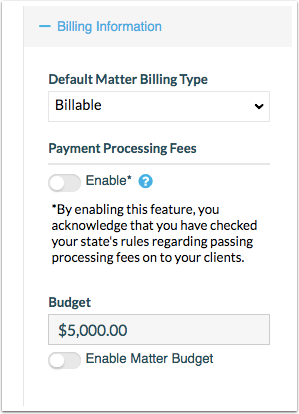 You can assuage your client’s worry with this simple and efficient report that will show you how much has been billed and how close you are to exceeding your client’s budget. Create and apply the matter budget. 1. 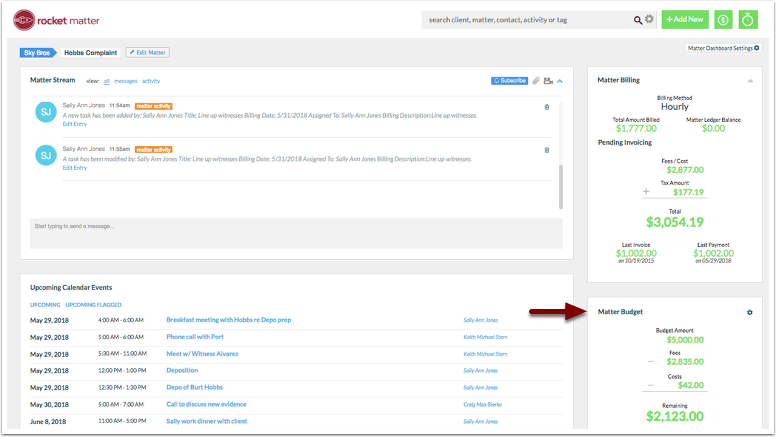 Navigate to the matter you'd like to apply the budget for and click on 'Edit Matter'. 2. Click to expand 'Billing information'. 3. 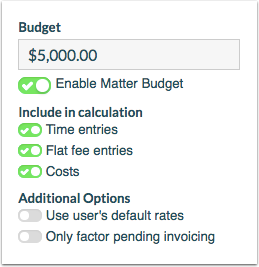 Enter budget amount and click to 'Enable Matter Budget'. 4. 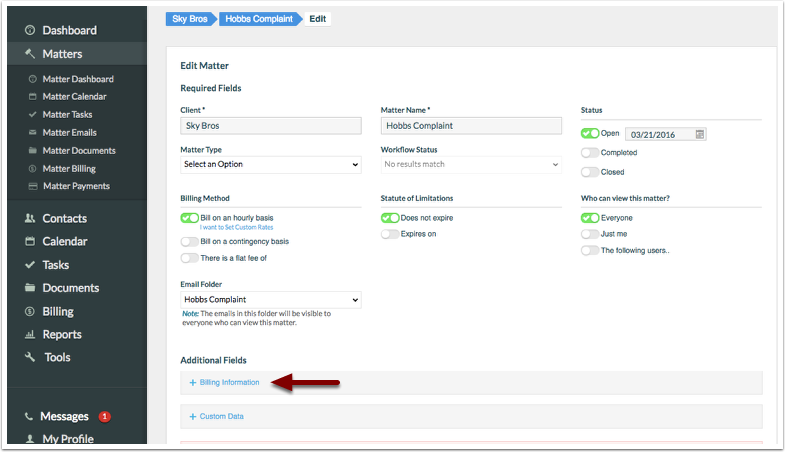 Once enabled, you'll be prompted to select additional filters. 5. Once finished, be sure to click 'Save Matter'. 6. 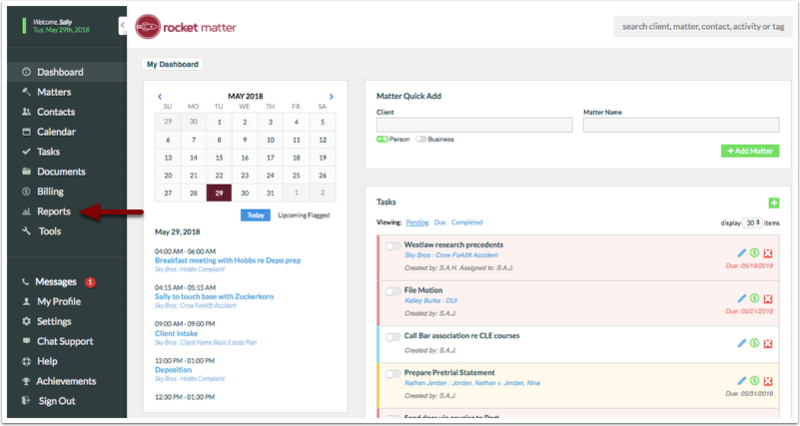 Observe Matter Budget results on the right-hand panel of the 'matter dashboard'. The Matter Budget Report can be generated for all matters at any time. Even if you are already halfway through a case and your client presents the need for a budget, you can quickly establish one within the matter. If you wish to take your reporting a step further or to share this information with your client, this report can be easily exported to Microsoft Excel. 8. Click on 'Reports' on the left-hand navigational panel. Don't see reports? Contact your Rocket Matter account administrator for further permissions. 9. Select the following report: 'I want to see a list of matters with budgets'. Click on the green 'Export' to easily export this information into Microsoft Excel. 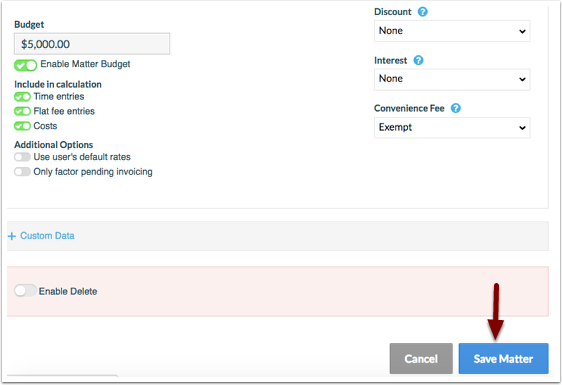 Prev: What does "Days since invoice was generated" mean? Next: How to delete a payment.